In case you might like to know who are the “Flourishing” leaders of MOPS 2015-2016 . . .
Rachel Schory (Coordinator) is wife to Kelly, mom to Benjamin (6) and Annabelle (2), lover of Jesus, and a recovering perfectionist (who sometimes falls off the wagon). Her love languages are coffee, chocolate, and Dr. Pepper. She is a volunteer LifeCoach at her church and truly enjoys helping others. She has been involved in MOPS of Newnan for 4 1/2 years and loves everything about this group–especially YOU! Heather Sewell (publicity & MOPPETS) is has been married to her high school sweetheart, Kyle, for 6 years! She is mama to Sarah (3) and has one angel baby. She has a wedding and event planning business. She loves Jesus, crocheting, and reading! She has been involved with MOPS for 2 years, but this will be her first year on Leadership! She is looking forward to this MOPS year! Stephanie Lara (Creative Activities) has been married to her husband, Will for 11 years. They have three children, Autumn(7), Ethan(6) and Willow (3). They moved to Newnan 1.5 years ago from central Illinois and through MOPS they have found great friends, who are like family to them! She loves Jesus, family-time, coffee, crafts, chocolate & travel. She is very excited to be in her 4th year of MOPS! She is happy to be serving with Kathryn in creative activities. She looks forward to seeing familiar faces as well as some new ones this year! Kathryn Fetner (creative activities) is married to her best friend Jason, and has two beautiful daughters, Maya and Annabelle. She has a Bachelor degree in Criminology from the University of West Georgia but has always wanted, and loves to be, a stay at home mom. She is a born and raised Peachtree Citian with a 7 year hiadis as a Newnanite. Her family has resided in Georgia since they came over from Europe hundreds of years ago so she comes from a long line of wonderful southern cooks. She loves to walk, read, watch scary movies, travel, and be artistic when time permits. One day she hopes to become a Floridian and live as close to the beach as possible. Oh yeah, and GO DAWGS! Cassidy Dupre(discussion group leader) was born and raised in Upstate New York where she married her high school love Jay. In 2009 Jay and Cassidy decided they needed more sunshine in their lives so they packed up and moved to Newnan, Georgia. She is currently a full time mom and teacher to four beautiful girls(Iris, Layla, Bella, and Hattie). Cassidy has been attending MOPS for three years, this will be her second year on leadership. She enjoys listening to music, dancing (at her home), the thought of using her sewing machine and the color pink! Naomi Karrels (discussion group leader) I have been a member of MOPS since….. a long time and on leadership almost as long ;). Okay, I am terrible with dates, obviously! I have a wonderful husband, Michael and two beautiful boys, John Michael (7) and Victor Andrew (4). We also have a baby girl in Heaven. I enjoy reading and watching TV to disconnect from the world. I am a homeschooling mom and I love every minute of it! Jesus is my Rock and I couldn’t walk this road without Him. I look forward to this year in MOPS and I know we will have an amazing time! 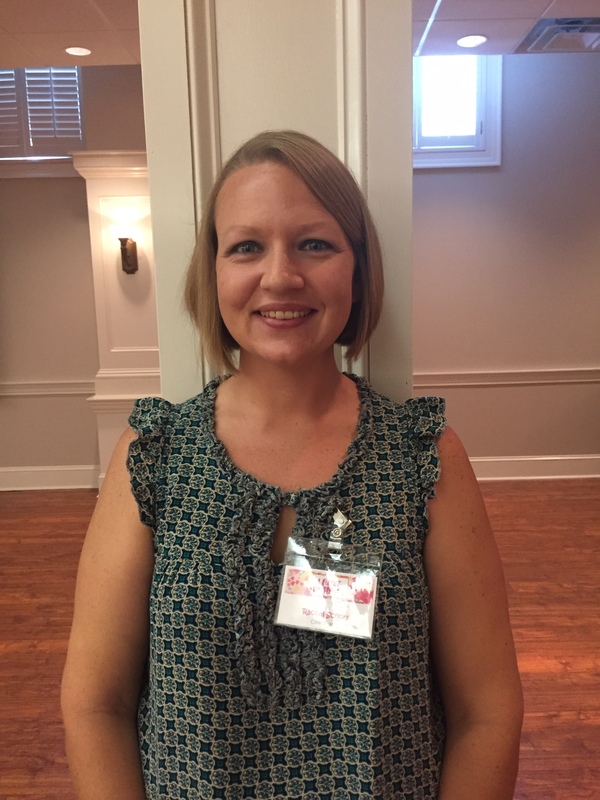 Abby Smith (discussion group leader) has been involved with MOPS for 8 years—5 in Newnan and 3 in Indianapolis. She is mom to Ava (8), Jackson (6), and Emerson (almost 2). She has been a vegetarian for 20+ years and enjoys cooking, reading, bargain hunting, visiting family, and spending way too much time on Pinterest and Facebook. Laura Prout (discussion group leader) is a “working” stay at home mom that balances family life with teaching online courses for Ashford University and teaching fitness classes at Atlanta Fitness and World Gym. Originally from Snellville, Ga, Laura and her husband, Rob moved to Newnan 13 years ago and fell in love with “The City of Homes”. Laura taught Civics and Economics at Newnan High School until she gave birth to her first child, Roselyn who was followed by brother Carson. Laura recently welcomed her third child, Estelle, in June and is happy that this means she can stick around in MOPS for a few more years! Though a fitness instructor, Laura does like to indulge in her favorite foods on occasion- cake and ice cream. Rachel Espinoz (discussion group leader) has been apart of MOPS for 4 years! Last year, she enjoyed being a discussion group leader so much, she is back for more! She is a Wisconsin Native, a Florida resident and enjoys Newnan as home until her family moves again. She has been a military spouse to Walter, her hero solider, for 6 years. They have a blended family; Isaiah (16), Shalom (11), Abigail(4) and Liliana (2 in October). Besides quality family time, Rachel always enjoys learning, readying sharing health and wellness, cooking, being outdoors and traveling back to FL when time permits. This MOPS group has been a God-send to her and her family since day one. She looks forward to meeting all the new faces and reuniting with the old ones. Here’s to MOPS 2015-2016 together! Maddy Allen (hospitality) is wife to Robbie and mother to two sweet girls, Clare(9 months) and Audrey (3). They have been loving Newnan for almost 4 years. Her favorite activities are cooking, crafts, traveling, anything outdoors and of course spending time with beautiful mommy friends! She is so excited to be joining the MOPS leadership team this year! Heather McDonough (hospitality) is originally from Auburn, AL, and has lived in Newnan for 11 years. She graduated from Auburn University with a bachelor’s degree in Music Education and taught elementary music before becoming a stay at home mom. Heather has two children, Sean (8) and Robin (2), a husband, and a dachshund. She loves to read, and is your go-to person for young adult fiction recommendations and nerdy fandom discussions. And don’t be surprised if she occasionally breaks into song! Maranda Wood (hospitality) was born in Atlanta and moved to Newnan at age 11. She met her husband when she was 14 at East Coweta High School where they both graduated. After she graduated, she went to college at University of West Georgia. During her senior year of college she found Christ and has been walking with Him since. She married her husband on May 25, 2013, which was also the day she became mom to two of her children, Michael (6) and Halie (5). On July 17th, 2014 they welcomed their third son, Lucas. They attend South Side Church in Newnan. She is currently pursuing her Master’s in Business Administration. She enjoys shopping, spending time with her children, exercising and watching TV. She also loves to help people and volunteering her time and resources to help those in need! Heather Walker (Fundraising) was born in Savannah, Georgia but grew up in Macon. She attended the University of West Georgia and earned a Bachelors degree in Psychology and a minor in Women’s Studies. She met her husband at West Georgia’s Baptist Student Union. They have two children, Lorelai (3) and Sawyer (1). She loves theater and acting. She has a passion for helping minister to fellow moms and middle and high school girls. Heather hopes that one day she will be able to use her degree in Psychology or maybe even be in a film, but right now she is called to be a stay at home mom. Raising babies is a full time job, but she wouldn’t trade it for anything!